This is the German paperback edition of People of Darkness, the fourth book in Hillerman's Navajo mystery series and the first novel featuring the protagonist Sergeant Jim Chee of the Navajo Tribal Police. This edition was published in June of 1997 by Rowholt Taschenbuch Verlag GmbH in Hamburg, Germany. The text was translated into German by Klaus Fröba. 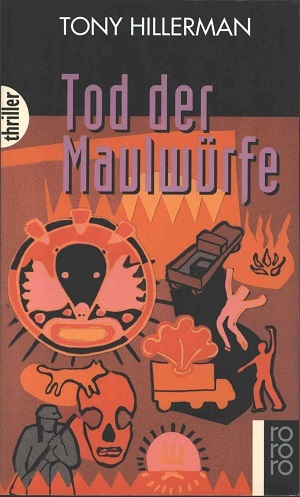 The cover was designed by Walter Hellmann and features an illustration by Britta Lembke. Binding: Paper covers with full color illustration. The thriller number, title, author, and publisher's device printed vertically on the spine.